A modern take on the Chukka boot from Dr Martens. With a hint of rock & roll edginess, the Ramsey has the perfect meld of Creeper profile and low wedge sole in an ankle boot style combined with black smooth leather uppers and a hair-on, cowhide-patterned panel and conical black pyramid studs. The Ramsey mens and womens chukka boot is fastened with rounded black laces through a three-eyelet D-ring lace-up and is lifted from the ordinary by its black and white, fresian pattern, hair-on leather apron front. Keeping Dr Martens heritage, the unisex Ransey Chukka is Goodyear welted with a grooved edged sole unit, iconic yellow stitching and scripted heel-loop. 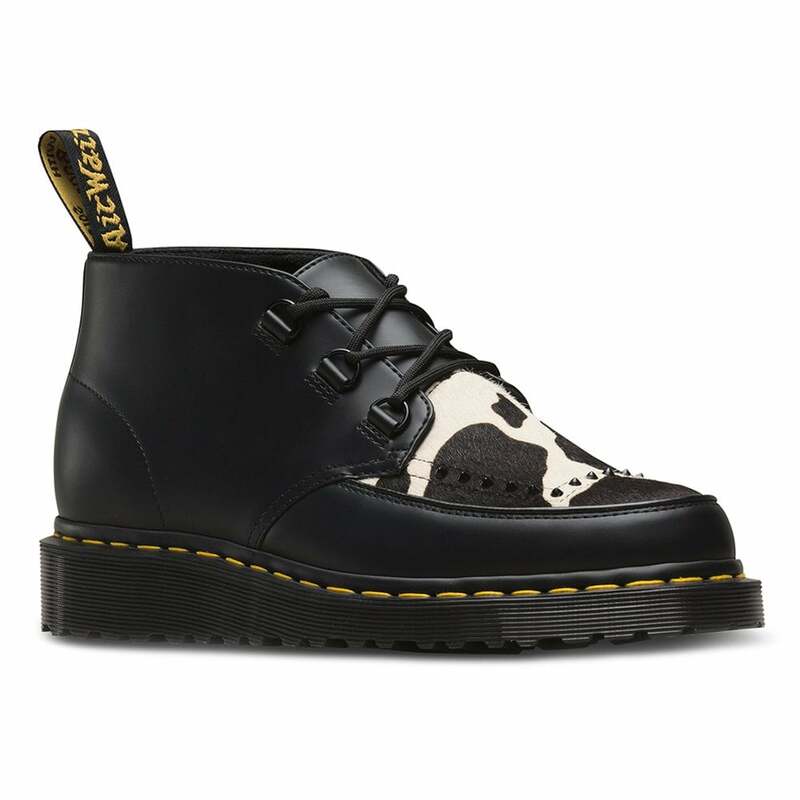 Just designed to be different; get your pair of Dr Martens Ramsey mens and womens chukka boots right now! Please Note: The uppers of this footwear are made from natural bovine leather with a print applied and is not as durable as standard leather. To clean, brush with a soft hairbrush only.